The violin is a popular instrument in South India just as it is in the U.S. However, the way it is played in South Indian Carnatic music traditions is so different from the way it is played in Western symphonic traditions that it is practically unrecognizable as the same instrument. Even though the physical structure and strings of the violins are the same in each place, the systematization of sounds and the combinations in which they are played are so different that the violin is not the same violin. The theories and principles underlying Indian Carnatic and Western symphonic music are so different that, despite the use of similar techniques on a common instrument, the resulting music is very different. The perspective of the one playing the violin completely changes how it is played. So in important ways, a violin is not just a violin—what the violin is depends on who is playing it and how it is played. Even though external objects (in this case a violin) appear to have fixed realities, in fact what they are is largely decided by what we (as the perceiver of the object) project on to them, which is largely a result of our own training and experience. The same holds true for the importation of yoga from India into our own countries, and for the practice of applying yoga for healing. The practitioner’s ideas regarding what yoga is, and especially what the human system of body, mind, emotions, etc., is, have a profound influence on how yoga for healing is practiced. The human system is also like the violin. Different cultures have different therapeutic practices based on different understandings of what the human system is and how it operates. Consequently, these systems lead to different ways of responding to the same malady. What should be done, when, and how are different in different therapeutic systems. Conventional Western medicine, yoga and Âyurveda, Chinese medicine, and homeopathy treat the same symptoms in dramatically different ways. As the application of yoga for healing becomes increasingly prominent in the West, we must remain conscious of how it is happening. Is the application of yoga for healing remaining true to its origins while being adapted to meet Western cultural contexts? Or, as is seemingly more common, is it being fundamentally changed and recreated by the familiarity of its Western practitioners with Western medical theories and principles? Is yoga for healing becoming assimilated into Western medicine, psychology, or physical therapy? Or is it still retaining the essential elements that compose its unique therapeutic perspective? To answer the question, “Are we adapting yoga for healing to Western contexts or are we fundamentally changing it into a system founded upon a Western episteme?” we need to look as closely as we can at the therapeutic application of yoga in its original context. Yoga has been developing in India for at least the last 2000 years, so we know that: (1) The origins of yoga for healing are Indian; (2) The epistemological foundations of yoga for healing are Indian; (3) Yoga for healing emerged out of, and in accordance with, Indian understandings of the body, mind, and human system; and thus (4) Yoga for healing is related to, and indeed the product of, these Indian anatomies. To understand what yoga for healing is and how it works, we need to know how it views the human system (body and mind), and why it holds these perspectives. The answers to this question can be found, at least in part, by looking for traditional Indian anatomical models that have been influential in India at different times over the past 2000 years as yoga developed. It is from those anatomical models, and indeed in response to them, that yoga’s ideas about the body and mind—and how to deal with them—were developed. Three Indian anatomies have been particularly influential in the formation of yoga for healing as both a philosophical and a practical medical system in India: (1) the pañcamaya model, (2) the prâna vâyus model, and (3) the model of the subtle anatomy. Together, they describe a single very rich and detailed geography of the human system that has important ramifications for the practice of yoga for healing. By briefly examining these three anatomies, we will see some of the fundamental principles underlying the application of yoga for healing. It’s worth acknowledging that Âyurveda is also an important and rich source of Indian anatomies that have deeply influenced the application of yoga for healing. However, a discussion of Âyurveda is beyond the scope of this article. 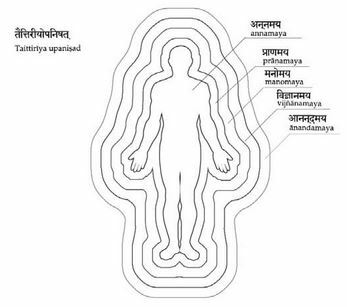 One of the most important bases for yoga’s truly holistic model of the the human system is presented in the Taittirīya Upanisad*, in particular the Brahmânandavallī section. It is called the pañcamaya model. Pañca means “five” and maya means something “pervading.” The term pañcamaya thus indicates that the human system is composed of five fundamental dimensions (physical body, breath/prâna, intellect, personality, and emotions) that are completely interconnected and interrelated. Indeed, as the text says, they pervade each other. Practically speaking, each of us has a body. The body breathes, and if the body stops breathing, then it becomes a very different body! So body and breath are inseparably related. Also, each of us has an intellect that has been trained in specific ways: a dentist, a carpenter, and a philosopher have received very different training. 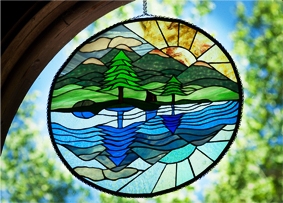 In addition, each of us has our own way of perceiving and communicating—we each have our own personality. Lastly, and most powerfully, we have emotions. None of these five dimensions by itself can completely describe who we are as individuals, but together they present a complete picture of the individual. The word the Taittirīya Upanisad uses, “maya,” is a special word. It indicates that each dimension of our human system (body, breath/prâna, intellect, personality, and emotions) is one hundred percent present throughout the system. It is not that each dimension represents a separate layer distinct from the other aspects, but that all the five dimensions are completely present everywhere in the system at the same time. This interrelationship between the different dimensions of the human system can be approximately represented by the drawing by Mr. TKV Desikachar (shown below). Each maya has five components, here represented by separate dots. The interrelationships between dimensions is expressed by connecting each dot to all the other dots. The interconnectedness described by the pañcamaya model is the positive basis of yoga as a holistic system of healing and health. It is also the theoretical underpinning of almost all yoga practices. For example, by changing the length of a person’s breath (through âsana and/or prânâyâma), we can greatly influence that person’s mental and emotional state. The same is true of working on the mental level. By asking the practitioner to focus on a particular object, we can see that the breathing also changes, and over time so do the body and personality. This process takes time, but it is a key mechanism underlying the effectiveness of yoga for healing. It is worth noting that this holistic approach is fundamentally different from the emphasis on specialization in Western approaches. Conventional Western medical and psychological models for healing often define specific fields of specialization, which focus on single dimensions of body or mind in great depth with less regard for other dimensions. Since we see the importance of yoga’s holistic understanding of the human system, it is also worth making a clarification regarding the terminology of this pañcamaya model. Unfortunately, in the United States, the pañcamaya model is often referred to as the kosas, which in turn is most often translated into English as “sheaths” and graphically misrepresented as a series of ever larger areas surrounding the body as depicted in the diagram below. This presentation (shown in the illustration) of the pañcamaya model is potentially misleading. The first problem is the word kosa, which does not appear in the Taittirīya Upanisad at all, and which literally means “bag.” The connotation of kosa as “sheath” or “bag” is very different from maya’sconnotation as “pervading.” The former seems to indicate separateness, while the latter indicates inseparability. 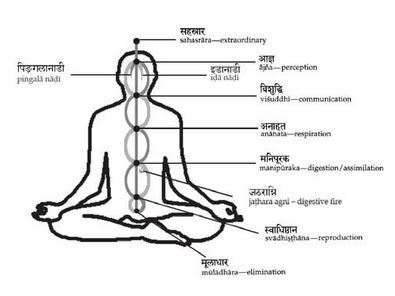 For example, in Sanskrit the internal organs are called kosas, which is correct when applied to the internal organs because the liver, the intestines, bladder, lungs, etc. are all discrete entities separate from one another. Essentially, they are bags containing specialized tissues that perform a function specific to that bag. However, when kosa is used to describe the interrelated aspects of the pañcamaya model, it can easily give the impression that each of the five dimensions is a “layer” or “level” or “sheath” different and somehow separate from the other dimensions. As we’ve seen above, separateness is an idea inconsistent with the meaning of the text and indeed is nearly the opposite of what the text intended. 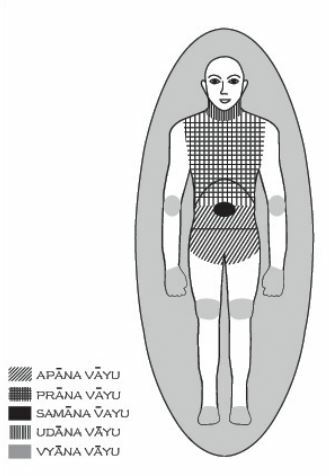 The Taittirīya Upanisad specifically says that the prânamaya (breath/prâna), manomaya (intellect), vijñânamaya (personality), and ânandamaya(emotion) dimensions are in the same location as the annamaya (physical body). A graphic rendition that depicts the different sheaths as separate from one another, and existing outside of the body in ever increasing rings, is undesirable. This misrepresentation of the pañcamaya model is not useful in the application of yoga for healing because it does not explain how the five maya relate to one another. If we are not clear about how they are related, then how can we utilize their interconnection to bring about healing? This is also why we should not think of any particular yoga tool as working on only one dimension (maya). Take âsana, for example. Âsana is not merely an activity of the physical body, but also of the breath and mind. In âsana we are actively moving the body in particular ways, but in doing so we must account for the fact that the body is already almost constantly moving (since it is breathing). Even if we stay in a single posture for an extended period of time, it is not possible to be absolutely still in that posture. At the very least, we must breathe, and with each breath the chest and abdomen cavities expand and then contract. The same expansion and contraction of the chest and abdominal cavities occurs when we move in âsana: a forward bend contracts the chest and abdomen, and a back bend expands them. So moving the body in âsana is actually an extension of the movement already happening in, and created by, breathing. When we put the two together and move based upon our breath, we find that different âsanas facilitate different types of breathing. More specifically, some postures emphasize and support inhaling and some postures emphasize and support exhaling. In fact, âsana is specifically designed to function in this way. By doing so, it involves and thus affects the prânamayadimension at the same time that it is working on the physical body dimension (annamaya). 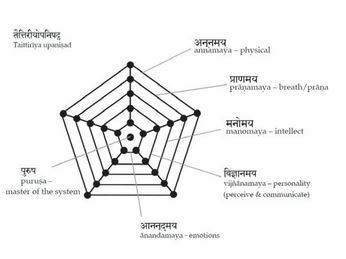 In addition to working on the annamaya and prânamaya dimensions, âsana also works on the manomaya (mental dimension). Âsana requires attention and mental focus. If we’re not paying attention, we can’t coordinate the movements and breathing very well at all. In fact, if we don’t pay attention, our breathing changes and we end up with a different result. In other words, even something as seemingly straightforwardly physical as âsana was not conceived by the ancient yoga masters as working only on the physical dimension. The point is that yoga’s understanding of the human system is holistic in specific ways. It is not accidental or mysterious, but, rather, concrete and definite. How and why the different dimensions of the human system interrelate to one another are described in texts like the Taittirīya Upanisad, and can be used in the application of yoga for healing. Moreover, the various Yoga tools and techniques are based on, and gain their effectiveness from, these principles. The second anatomy worth examining is the model of the prâna vâyus. This model relates to the prânamaya (breath/prâna) dimension of the pañcamaya model, as it describes the functioning of prâna and breath. However, it is different from the pañcamaya model in both structure and origin. The prâna vâyus model is not described in the Taittirīya Upanisad, but in many other texts, including the Yogayâjñavalkya Samhitâ. One way of understanding prâna is “that which supports the physiology of the body.” In this capacity, prâna is sometimes compared to the role of electricity in electronic machinery. Without the electricity, nothing in the machine works, but when electricity is present (assuming the machine is in operating condition) it enables the machine to perform all kinds of different functions. 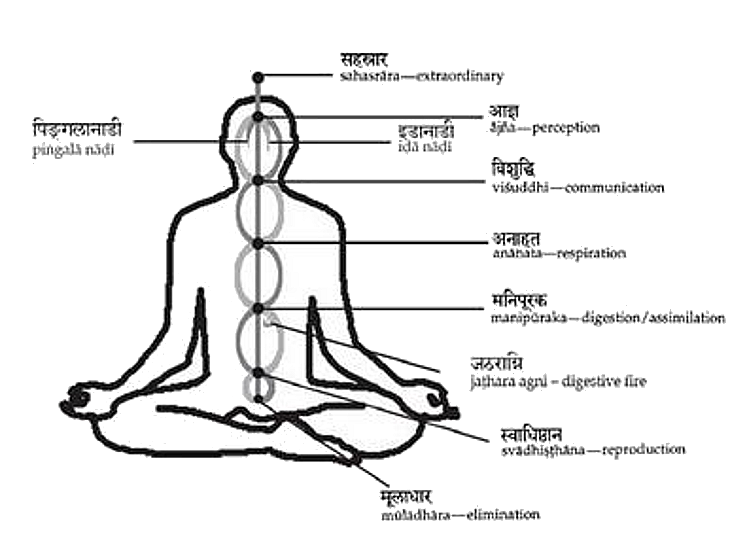 In the prâna vâyus model, prâna in different areas of the body is known by different names becauseprâna in different parts of the body supports different functions. For example, as shown in this illustration, prâna in the chest area is called prâna vâyu. This area is considered to be the seat of the mind and the emotions. Prâna in the abdomen is called apâna vâyu and is responsible for reproduction as well as the elimination of bodily waste. The prâna located in the area surrounding the navel is called samâna vâyu and governs digestion. The prâna in the throat region is called udâna vâyu and governs communication. 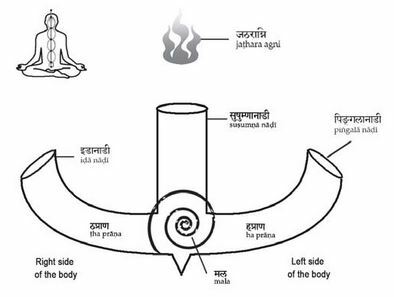 Lastly, the prâna governing circulation and the transportation of nutrients throughout the whole system is called vyâna vâyu, and this prâna is located throughout the body, particularly the joints. These are only the five most important of the ten major prâna vâyus that are most commonly described in texts. This anatomy is a critically important foundation for explaining how yoga works on different areas of the body and different functions of the human system through different breathing patterns and yoga techniques. For example, the ancient yogis noticed that different areas of the human system strongly respond to different types of breathing patterns. It was noticed that the apâna region responds to breathing ratios with an emphasis on exhalation, and that the prâna area responds to breathing ratios with an emphasis on inhalation. They also noticed that nyâsa and mudrâ affected the vyâna vâyu, and that different chanting could affect the udâna vâyu in different and predictable ways. When we combine the perspective of the prâna vâyus with the pañcamaya ideas about the interrelatedness of the different dimensions of the human system, we can begin to see how these anatomies not only influence, but truly direct our treatment decisions. Different tools can be used to influence different parts of the human system in very specific ways. For example, we can generalize that if there is a problem in the apâna region of the body, then two tools that could be used to influence the apâna area of the body are exhalation and forward-bending âsanas. Of course, this does not mean that all apâna area problems should be handled with forward bends and exhalation. There are many nuances and principles which a person must know before applying yoga for healing, and it is not the intention of this article to explain how to apply these principles in depth. Rather, the intention of the article is to show that the application of yoga for healing is built on yoga’s understanding of how the human system functions. These models of anatomy provide predictable guidelines for how the human system can be influenced through different yoga techniques and methods. In other words, applying yoga for healing is not primarily an intuitive practice, but rather a practical science (and art) following definite, well-defined guidelines. The subtle anatomy model is also related to the prâna vâyus model and the pañcamaya model. Like the prâna vâyus model, it too describes how prâna functions in the human system. According to the subtle anatomy model, prâna circulates in the human system through a series of tubes called nâdīs. These nâdīs are the passageways through which prâna is able to get to different areas of the system. Though there are many nâdīs throughout the human system, three are usually considered the most important. As shown in the diagram, the susumnâ runs from a location near the base of the spine, up the back of the body (approximately near the spine), to slightly above the crown of the head. The pingalâ, which originates at the tip of the right nostril, and the idâ, which originates at the tip of the left nostril, run up through the forehead, where they cross (but do not intersect), and then down along the back of the body near the spine to the base of the susumnâ. As they move down the back, they cross each other (without intersecting) four more times until they join together with the susumnâ at its base. The prâna in the pingalâ is called the “ha” prâna and the prâna that is in the idâ is called the “tha” prâna. According to this anatomical model*, one of the points of a yoga practice is to help move the ha and the tha prâna from the pingalâ and idâ nâdīs into and up the susumnâ nâdī. This, not incidentally, is where the word “hatha” yoga originates. What complicates this process is that the ancient yogis thought that at the base of the susumnâ nâdī is a blockage preventing the ha and tha prâna from entering the susumnâ nâdī. The material that is blocking the base of the susumnâ nâdī is called many different names. In some texts, the name given to the material blockage at the base of the susumnâ nâdī is kundalinī , a word that literally means a circular or winding shape and comes from the idea that the kundalinī is coiled around itself 3.5 times. Another name for the material blockage is mala, which literally means “impurity” and signifies things that are unhealthy for our system and should be eliminated. This malamay be physical (annamaya), as results from bad food or poor digestion; it may be emotional (ânandamaya), resulting from some difficult experiences; it may be unuseful communication styles (vijñânamaya), or even negative attitudes (manomaya). In other words, the impurity may be in any or all dimensions of our human system. According to the subtle anatomy model, yoga practice is the process by which this blockage is destroyed and the ha and tha prâna are thereby able to flow into and up the susumnâ nâdī. The ancient yogis thought that the blockage could by eliminated by burning it in the digestive “fire” in the abdomen, and they correlated different aspects of breathing with different cleansing actions on the impurity. For example, exhaling was thought to bring the impurity up to the fire to be burned. This corresponds to the observation that when you exhale fully, the abdomen contracts and rises slightly. Inhaling was thought to blow the flame of the digestive fire toward the impurity at the base of the susumnâ nâdī, thus burning it up. So breathing is a fundamental aspect of âsana because it is the mechanism which results in the elimination of the blockage preventing the prâna from flowing into the susumnâ nâdī. In fact, the classification of postures into paścimatâna and pūrvatâna is based upon the type of breathing the postures support. Paścimatâna postures support exhaling since bending forward is so much easier while exhaling, and exhaling brings the impurity toward the fire in the abdomen. Pūrvatâna postures support inhaling since inhaling naturally arches the back and inhaling directs the fire in the abdomen toward the impurity. This model helps show how the physical practice of âsana is designed to affect the human system on multiple dimensions, in particular the prânamaya dimension. Thus, the ancient yogis conceived the practice of yoga as having a focus that is fundamentally different from the typical Western attention to flexibility and alignment of muscle and ligament. These anatomies describe the functioning of the human system, and in doing so serve as maps showing routes of treatment. They show how to apply yoga tools and techniques for healing. By understanding their descriptions of how the human system functions, we know how and why various yoga techniques and methods were conceived. Simply put, these Indian anatomies explain how and why yoga’s various tools work. Of course, different tools work in different ways and on different parts of the human system. So we can see why different yoga practices produce different effects, and how to purposefully elicit different effects in ourselves and students. As a result, our yoga for healing treatments can account for myriad differences in individuals, symptoms, circumstances, causes, times, and so on. Each of these three ancient Indian anatomies describes a specific portion of the human system in some detail. In doing so, they overlap, and some details do not correspond exactly with details from the other anatomies. However, that does not mean that one is right and the others wrong. Instead, if we understand what each offers, we find that they are very compatible with each other. When applied together as a whole, they present an incredibly rich and fertile geography of the human system. We can now see that what is and is not “Yoga Therapy” is determined not by which yoga tools are used nor by the effects they engender, but rather by the understanding with which the tools are applied. Yoga therapy is not yoga therapy by virtue of its using yoga techniques or methods, but rather by virtue of its yogic understanding of how these tools are used. This understanding is based on yogic understanding of the human system, ideas that are very different from conventional Western medicine. For example, a particular position of the body is not, by itself, yoga therapy (or even yoga for that matter). Physical therapists also put the body in different positions, many of which resemble âsanas. But unless it is supported by yoga principles as described above, an âsana is only a position of the body. In fact, an âsana separated from breathing, from mental attention, and from the Indian anatomical understanding from which it emerged, is no longer an âsana, even more so if it is applied according to conventional Western models of the human system. What differentiates yoga for healing from physical therapy, psychotherapy, and other Western therapies is the understanding of what we are trying to accomplish and what dimensions of the human system are involved in that process. What we do is not yoga therapy. How we do it is. The importance of this principle cannot be overemphasized. We have seen that the application of yoga for healing is not just the use of specific techniques or methods, but rather a holistic therapeutic perspective towards the human system and the process of healing. It is not just a few techniques or methods that define yoga for healing, but rather the theory, method, and principles underlying how the techniques are applied. As practitioners of yoga for healing, we must be careful to understand and maintain yoga’s unique, holistic perspective. It is precisely this quality that makes yoga special, and it is crucial to yoga’s effectiveness. Ironically, it is also this critical quality that is most readily lost when yoga for healing techniques and methods are applied according to conventional Western medical principles and assumptions. Thus, it is of the utmost importance to maintain the distinction between assimilating yoga tools and techniques into conventional Western medical practice, and practicing yoga for healing. In the former, applications are solely according to Western anatomies, while in the latter, applications are according to the subtle, pañcamaya, and prâna vâyus anatomies of ancient India. We need to ask ourselves, what anatomy is underlying our understanding and practice of yoga for healing? Indeed, what do we think we are trying to accomplish through the practice of yoga and âsana, prânâyâma, and meditation? Our imagined starting and ending points will strongly influence not only what treatments we can conceive, but also how we apply yoga for healing. * Desikachar, T.K.V. and Desikachar, Kausthub, information and translations orally transmitted in workshops and private classes between 2003 and 2007. 1. Desikachar TKV., Skelton, ML, & Carter, JR. Religiousness in Yoga: Lectures on Theory and Practice. Washington, D.C.: University Press of America; 1980. 2. Desikachar TKV. The Heart of Yoga: Developing a Personal Practice. Rochester, Vt: Inner Traditions International; 1999. 3. Desikachar TKV, and Desikachar, K. Yogayâjñavalkya Samhitâ: The Yoga Treatise of Yâjñavalkya. Chennai, India: Krishnamacharya Yoga Mandiram; 2000. 4. Desikachar K, assisted by Bragdon, L and Bossart, C . The Yoga of Healing: Exploring Yoga’s Holistic Model for Health and Well-being. International Journal of Yoga Therapy. 2005; Vol. 15. 5. Desikachar TKV, and Desikachar, K. Adi Sankara’s Yoga Taravalli, an English Translation and Commentary. Chennai, India: Krishnamacharya Yoga Mandiram; 2004. *Special thanks to the International Association of Yoga Therapists (IAYT) for allowing us to republish this article which first appeared in the “International Journal of Yoga Therapists (IJYT). 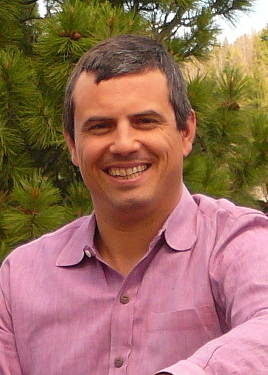 Chase Bossart has been studying yoga as a personal student of Mr. TKV Desikachar’s since 1991. He has made numerous trips to Chennai and spent more than 4 years in Chennai studying one-on-one with Mr. Desikachar and his wife Menaka (Vedic Chanting), observing therapeutic classes at the Krishnamacharya Yoga Mandiram (KYM) and participating in group trainings by his son Kausthub and other long time students of Mr. Desikachar. He is the Director of the Yoga Well Institute, a non-profit healing center in San Francisco specializing in the therapeutic application of Yoga in the tradition of Śrī T. Krishnamacharya & Mr. TKV Desikachar. The institute is committed to providing practical teachings and methods to help you live a purposeful & satisfying life. Chase as well e teaches frequent workshops across the US on a wide range of yoga topics, and especially loves leading experiential workshops that demonstrate yoga philosophy’s practical applications in daily life.